Ham is a great choice for the holidays because it feeds a crowd and is easy to cook. Add the brown sugar glaze during the last 30 minutes of cooking. For this recipe, look for a 7-9 pound, bone-in, spiral sliced, smoked ham. 1) Unwrap the ham from it’s packaging and remove the plastic disc covering the bone (you might not see it at first). Wrap ham in aluminum foil. 2) Place the ham cut side down in a roasting pan with a rack and cook at 325° for 10 minutes per pound (the weight will be listed on the packaging). You’ll end up cooking it for an hour and a half or so. 3) To make the glaze, heat the brown sugar, orange juice, and apple cider vinegar in a small saucepan until the brown sugar melts and is bubbly (about 5 minutes). During the last 30 minutes of cooking, unwrap the ham from the aluminum foil, place it back onto the rack of pan, cut side down, and pour the glaze all over the top. Bake for 30 more minutes. 4) Let the ham rest for 10-20 minutes. A spiral cut ham is already sliced, so it’s easy to serve. 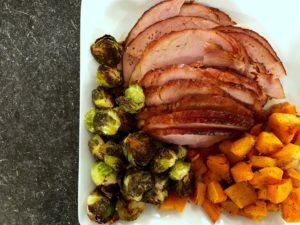 Copyright © 2018 Our Everyday Dinners - This is an easy recipe for how to make Brown Sugar Glazed Ham.